Thank you for visiting our very crafty blog! Now that you're here, why not learn a bit more about who Trimcraft are, what we do, and about our website. Based in Nottingham, UK, Trimcraft has been trading for many years, establishing itself as one of the leading arts and craft suppliers. Now that we've got a trendy new website to share with you all, we'll tell you a bit more about some of the changes we've undergone. We have changed our name of our blog to The Craft Blog by Trimcraft. Change is always good but we have ensured to keep everything we love from our old blog - you’ll still find our fabulous tutorials, freebies, giveaways and our forum! Trimcraft was first established in the 1970s as a haberdashery manufacturer and importer. In early 2000 Trimcraft saw the transfer from a mainly haberdashery company to a craft business. Since then, the company has experienced accelerated growth, establishing itself as a major player in the Arts and Crafts Industry. Now in 2019, we have a wealth of craft tutorials and products that we are super proud of which we hope inspire your daily crafting! 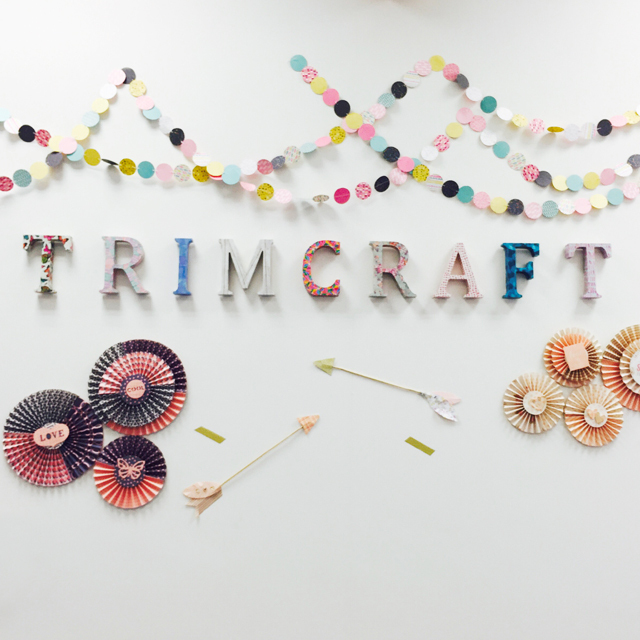 Trimcraft offer a wide variety of craft products ranging from on-trend paper packs to exciting embellishments and the coolest dies on the market. Our flagship brand Dovecraft is famous for its high quality products and is the leader in the market for papercraft design. You might recognise some of our collections: Bee Happy, Folkland, Sweet Moments, and Fairy Tales are all some of our wonderfully designed ranges. Our First Edition brand features new and upcoming designers' work in the form of beautiful patterns! Each paper pad features dazzling effects to give your crafts the professional look they deserve. Every collection includes a selection of albums featuring the gorgeous designs found in the paper pads, perfect for those who like to treasure their memories in a high quality album. Simply Creative offers a wide array of products, from paper pads to gems! This value collection is perfect for children, adults, craftaholics or crafty newbies alike. Featuring designs from our talented in house designers, the collection of Simply Creative products are a must have for any crafter. Or why not bring your craft projects to life with the Paper Addicts paper pads? Enjoy fun, contemporary patterns across a variety of themes to help you add an on-trend, decorative touch to your scrapbook pages, handmade cards, journals, and more. Paper Addicts paper pads offer excellent value without compromising on style or quality, with each pad beautifully illustrated with hand drawn designs. We also have a stylish adhesives brand named Dot & Dab! Developed by crafters for crafters, we offer a range of adhesives for a variety of applications. Selected papers, Deco Maché and decoupage products from Trimcraft brands are FSC® certified and show our commitment to use paper from responsible sources (FSC C119211). Look for FSC certified products on our website. We also print our paper pads using Soy Inks. Soy Inks are more environmentally friendly and make it easier to recycle paper. We are proud of our trendy social media pages as we love sharing all the latest news and sneak peeks with you! We also share gorgeous papercraft projects and offer you glimpses of what we are up to in the office. We update our social media platforms daily, so stay in the loop and give us a follow on Facebook, Instagram and Twitter! Our Pinterest and YouTube pages are both overflowing with inspiration in the form of video tutorials and free printables. These are the perfect pages to check out if you’re on the look for new, crafty ideas.